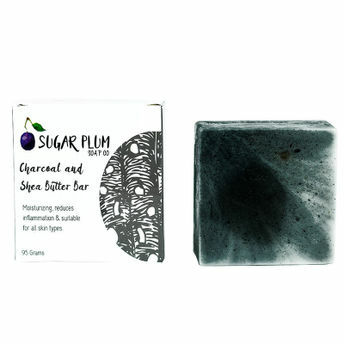 Sugar Plum Soap Co. Shea Butter & Charcoal Bar is integrating the multifarious skin benefits of activated charcoal and tea tree essential oil with the deep moisturising properties of shea butter. This pure, organic handcrafted soap gets rid of excess oil in the skin and keeps the skin free of infections and blemishes. Tea tree oil in it helps to treat acne and shrink pores, while shea butter nourishes and moisturises the skin. Activated charcoal makes the skin tighter and firmer and prevents premature ageing. This soap also clears skin blemishes and acne scars. Use it to reduce dandruff and to keep psoriasis at bay.